Camping to me usually involves bugs, rocks digging into my back, lots of outdoor activities such as hiking, swimming, sitting around the campfire and of course s'mores. Well only in the Bay Area does camping also involve wine tasting in Sonoma county and walks along the beach. 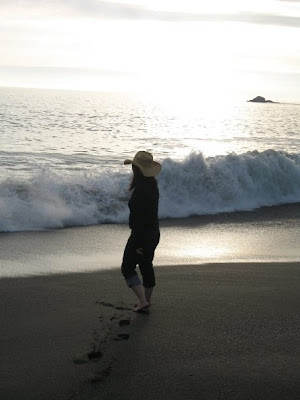 I went this past weekend to Bodega Bay in Sonoma County for a little trek into the wilderness and wine tasting. It was amazing camping along the beach at Bodega Dunes watching the sunset over the ocean, while sipping on wines bought that day from the wineries we visited. The company was amazing thanks to an eclectic group of characters whom I really enjoyed getting to know. There's something about being gathered around a campfire that really loosens the tongue or it could have been the wine. Either way it was great company! During the weekend we also had some wonderful local eats that I wish that you could try. Oysters from Tomales Bay Oyster Co. Which we shucked right at the campsite for some raw eating and then later popped over the fire for some BBQ'd oysters. Sonomic Vinegar which we didn't actually eat right away, but had tasted at a Kastania Vineyards. The Vinegar was a really sweet tangy balsamic reduction with hints of wine. It was complex and super tasty. I can't wait to try it at home over some grilled veggies. I bought dessert wine at Point Reyes Winery for some champagne cocktails. The next day involved a visit to Iron Horse Vineyards, where the champagne went straight to my head. There was also Chateau St. Jean, which was seriously beautiful as was Cline Cellars. In between the wineries we managed to stop by Marin French Cheese Co. where there was garlic flavored brie. Yum! We took our wine and cheese to picnic at Kozlowski Farms where they make their own preserves and pies. Frankly my dear I'm not even a fan of pie, but that strawberry pie pretty much made me a pie convert. In case you were wondering yes I did spend pretty much the whole entire weekend eating and drinking wine. Seriously the best way camp ever and makes me so glad I live within driving distance of these spots. The good news though is that most of these places we visited ship!